More than seven years ago, the federal government signed off on a massive cross-border pipeline that would ultimately deliver over a billion barrels of crude from oil sands in western Canada to refineries in Wood River and Patoka, Illinois. Hardly anyone noticed. A permit application was submitted to the State Department in April 2006, approved in March 2008. The pipeline, which runs through six states, began delivering crude early as summer 2010 – with little buzz or concern. No, we’re not talking about the Keystone XL pipeline, but you’re close. The pipeline we’re referring to is the original 2,639-mile long Keystone pipeline – sans XL – built, owned and operated by TransCanada Corp. Yes, that’s the same Alberta-based company that has a request in to build another large-scale, cross-border pipeline – the Keystone XL, which is really just an extension of the aforementioned pipeline, a network that’s clearly working well and creating U.S. jobs. The Keystone (sans XL) carries up to 590,000 barrels of oil per day. It is full, and cannot hold any more oil. Meanwhile, the American refineries in the Gulf Coast region are hoping to replace the oil that they are importing from the Middle East and Venezuela with oil from Alberta and North Dakota - which is both cheaper and more reliable. Unfortunately, seven years after the permit application was submitted by TransCanada, the privately funded, 1,179-mile long project, which would carry up to 830,000 barrels of North American oil per day to refineries in the Gulf Coast, remains hung up by politically-driven green tape. Former Secretary of State Hillary Clinton says she opposes the project because it’s a “distraction.” The President remains silent on the issue. Why approve one cross-border oil sands pipeline but not the other, especially when there are already myriad other oil pipelines that crisscross the Canadian border? Shouldn’t this be treated like any other routine pipeline? Because, at the end of the day, Keystone XL is another routine pipeline. The U.S. has 2.5 million miles of America’s pipelines. Each works together and independently as energy and economic arteries, keeping homes heated and cooled and hospitals powered and safe while supporting millions of jobs and billions in economic output. KXL would do much of the same. According to President Obama's own State Department, the pipeline would support more than 42,000 manufacturing and construction jobs and contribute over $20 billion to the U.S. economy. Many of these economic advantages have already materialized in areas where the original Keystone pipeline is located. In five years, the Gulf Coast Pipeline — XL’s southern half — has injected billions in economies throughout Texas and Oklahoma after delivering more than 600,000 barrels per day of the same Canadian crude oil that Keystone XL would deliver. And since it will be built with high-strength carbon steel and equipped with various spill prevention and mitigation technology, Keystone XL will also be the safest pipeline ever built in America. 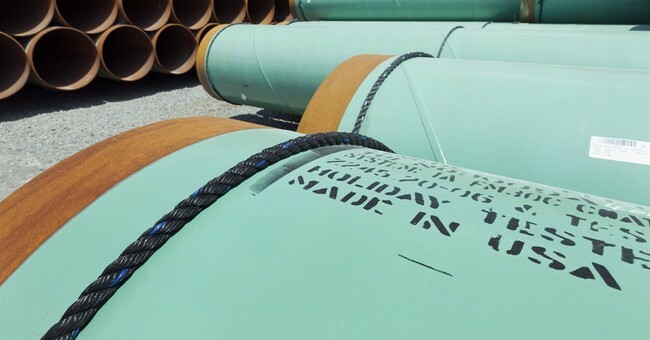 Poll after poll—from Consumer Energy Alliance to USA Today to Pew Research — shows that the majority of Americans want the Keystone XL pipeline up and running. Yet the president continues to veto or stall their efforts to get a yes or no on construction, even though all environmental studies and most pending litigation have been finalized. This isn’t normal. Just ask the Associated Press, which recently reported that the federal government has taken an average of 478 days since 2004 to give a yes or no to all pipeline applications not related to Keystone XL. That means TransCanada has waited more than five times the average for permission. Time is ticking. The U.S. has lost $175 billion in economic activity because of the administration kicking the can down the road on Keystone XL. The White House, declining to say what’s taking so long, continues to defer to the State Department, but their excuses are running thin. Mrs. Clinton is now on record as a presidential candidate who opposes a popular project. But the decision isn’t hers to make. Mr. President, listen to the polls. Listen to your constituents. Approve Keystone XL.